In this post, we’re going to talk a little about grout cleaning, but before we do, I thought it might be helpful to provide a little background. Grout used between tiles and is a mixture of cement, color, and sand. If not properly maintained by sealing and cleaning grout will become discoloured and full of mold and mildew. So when possible apply a grout sealer whenever installing tiles and grouting plan to apply grout sealer which will make the grout cleaning much easier. Dirt will collect porous holes on the grout surface and if it is not sealed, the grout will discolor because there is no protective sealer which covers, fills and permeates the porous surface. If not sealed, even mopping the floor will cause discoloration to the unsealed grout. All the dirt-filled holes will hold on tightly to the dirt and the mop will just move the dirt from one little hole to the other. When mopping, your tile grout (which has a rough surface) basically cleans the dirty mop by allowing the dirt in the mop water to fill in the tiny holes. Bottom line, if your grout is not sealed, it will become nasty, dingy and covered in dirt; thereby increasing the amount of grout cleaning you are going to have to do! Mold and mildew that is lurking in your damp shower will turn your grout to a nasty shade, too — all the way from a delicate pink to mottled brown, speckled or even solid black. The best way to clean it is to use water and general purpose cleaner to loosen the dirt from the grout and use a wet/dry vacuum to pull the dirt back up and out of the holes. Look for a stiff brush or a brush designed for grout, which are usually narrow and have tapered brushes. Scrubbing using a general purpose cleaner is fine, you can use a dilution of chlorine bleach and water mixed at 1 part bleach and 5 parts water. The bleach dilution is particularly effective in cases where you have mold or mildew. Once you have cleaned the grout take the time to seal the grout with a very good remember you get what you pay for, grout sealer. If you elect not to seal the grout, you will have a very nasty mess in a short amount of time – which will cause you to again go out and search the Internet for this page. If you don’t protect your grout with a sealer, it will become dirty and very difficult to maintain – period. Also use floor mats in your door ways to help keep the floors clean. In cleaning prevention is the key, using an entrance mat, or doing the extra work to seal the grout will go a long way to make ongoing grout cleaning much less work. There are three levels of cleaning surfaces; these levels are cleaning, sanitizing and disinfecting. Cleaning a surface removes visible dust and debris. Cleaning does not remove microscopic organisms cleaning only clears away any visible elements such as dust or dirt. Sanitizing a surface makes that surface sanitary or free of visible dirt contaminants that could affect your health. Sanitizing is meant to reduce the occurrence and growth of bacteria, viruses and fungi. However, it is important to know that it is not meant to kill any of these microorganisms. The final level in the hierarchy is disinfecting. Disinfection is needed if the surface or instrument must be free and clear of all visible and microscopic organisms. Disinfecting a surface will “kill” the microscopic organisms as claimed on the label of a particular product. 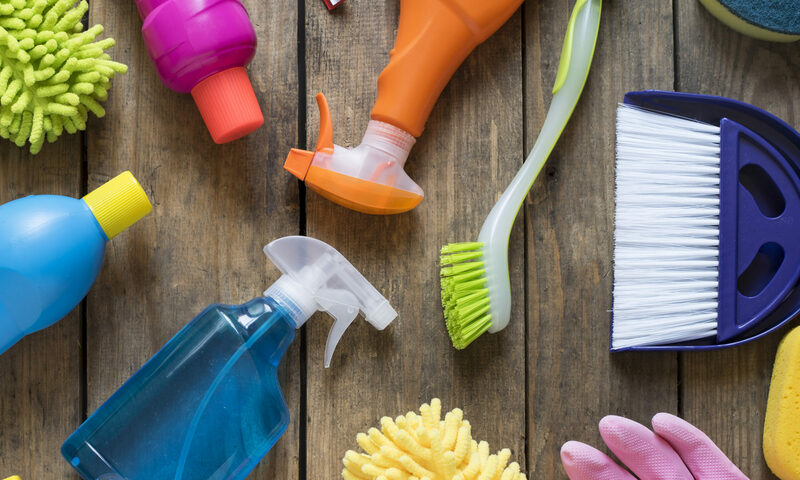 There are thousands of disinfectants on the market and deciding which one to use may seem like a daunting task; however, there is a way to simplify this decision. All disinfectants can be classified into one of five groups based on the active ingredient used when manufacturing the product. 70% isopropyl alcohol is the standard active ingredient and it is widely available. The other active ingredients include phenolic, quaternary ammonium, sodium hypochlorite (or bleach) and peracetic acid. Each of these active ingredients has different levels of effectiveness as well as differences in what they actually kill. Be sure to carefully read the product label and any literature supplied by the manufacturer. It is very important to verify that the product you choose does, in fact, claim to “kill” the bacteria, virus or fungi you are attempting to eliminate. One level of effectiveness that is measured by OSHA is determining the disinfectant is effective against tuberculosis. If a disinfectant is proven effective ones. Many studies so that phones are dirtier than toilets in most cases, phones are handled so frequently and often less attention is placed on the cleaning of your phone vs. your toilet seat. If you want be sure your housekeeper is doing a through job when cleaning the washroom you can turn out the light and shine a black-light around the toilet. The black light bulbs use long wave, ultraviolet light to illuminate substances practically invisible under ordinary light. The uric acid in urine glows brightly under black-light and can identify a superficial cleaning of the toilet, toilet bowl, or area around the toilets including the walls and floor. uric acid is the final oxidation (breakdown) product of purine metabolism and is excreted in urine. You can also use a black-light to find urine spots from cats or dogs that are hard to find and are the cause odor issues due to the fact you cant find the stains once they have dried etc. I have found this useful as my pets have aged and have had accidents during the day that I have not been aware of etc. There are two sources of recycled content, PCW (post consumer waste) made from resources already used. Flyers or newspapers you have read and have recycled etc keeping it out of the garbage. The other is pre-consumer waste, printing over runs, trim from newspaper etc. still good but not as good as keeping paper out of the landfill from material we have used already. The PCW content varies from 10% -100% so check the label. A quick, easy and streak less homemade cleaner for windows and mirrors can be made using vinegar and alcohol. Pour 1 cup off full strength white vinegar with 1 cup of isopropyl (rubbing) alcohol in a spray bottle. Let’s face it – when it comes to cleaning bathrooms, most people would rather have a root canal! Learning and using simple techniques can make this unpleasant task a breeze – well, almost. The trick here is to minimize motion and time by being well-prepared. The result will be a shining clean and sanitized bathroom that smells as clean as it looks. Collect your cleaners – bleach, mildew remover, disinfectant liquid and spray, glass cleaner, soap scum remover (Soft Scrub ®, Lysol ® Tub & Tile Cleaner, etc.) and liquid furniture polish. Add a two gallon bucket, rubber gloves, a sturdy scrub brush, an old toothbrush, household sponge, paper towels and a couple of soft clean rags. Wear your gloves to avoid getting harsh chemicals or irritants on your skin then spray the bathtub and shower stall with mildew remover or bleach. Allow it to “work” while you spray the toilet bowl inside and exterior with disinfectant. Pour a little disinfectant inside the bowl and let that sit for a moment while you use a rag or sponge to wipe the rim and the outside of the bowl, down to the floor. Don’t overlook the seat and the lid, and the area behind the seat. Using your regular toilet bowl brush or your scrub brush, reach inside that bowl, apply elbow grease and give that bowl a good scrubbing – then flush! Go back to your bathtub and shower that was sprayed with mildew remover – you may need to re-wet some surfaces but most of the work should be done for you. Removing soap scum can be an especially tedious job if there is a lot of build-up. Grab your scrub brush, and – working from top to bottom – begin gently scrubbing the tub or shower walls, then the bottom. Rinse to find areas that still need attention, apply a little Soft Scrub ® (or similar product) and continue until the scum is gone. Tub/shower doors may accumulate an especially stubborn build-up of soap scum. Again, using soap scum remover and a scrub brush along with elbow grease and a steady, over-lapping motion, scrub the glass from top to bottom. Use the toothbrush to scrub around seams, and the faucet and drain areas. Rinse all of the surfaces well, flooding with fresh water and allowing it to run off then wipe down with a dry clean rag. Glass enclosures benefit from an additional application of a glass cleaner, especially on the outside. Moving on to the sink and counter, gather all objects and move them off the surface. Spray the counter top with disinfectant, and the sink with household cleaner and/or soap scum remover. A household sponge laminated with Teflon ® surfaces abrasive material works well for the bathroom sinks and counters. Take the toothbrush and scrub around the faucet and drain to loosen any gunk or mildew. Rinse the sink well with fresh water then, using paper towels, wipe down the entire counter, faucet, and sink. When all bathroom fixtures are shining to your expectations, grab the furniture polish and a soft rag. Give your wooden counter faces a nice coat of polish to remove dust and protect from water stains.